Unfortunately, due to poor implementation by the Public Service Commission (PSC) and the utilities, EmPOWER Maryland energy efficiency programs are not delivering adequate electricity savings to meet 2015 goals. Maryland utilities can improve their performance and move the state toward an energy-efficient economy by adopting models for energy efficiency programs that are succeeding in other states. The Public Service Commission and the state’s utilities should move toward implementation of these programs and ensure that Maryland takes advantage of its full potential for energy efficiency. Energy efficiency is a powerful solution to Maryland’s energy problems. Energy efficiency saves ratepayers money on their energy bills. EmPOWER Maryland efficiency investments made to date are helping Maryland consumers avoid about $140 million in electricity costs annually. By reducing demand for electricity, energy efficiency helps increase the reliability of the state’s electricity supply and reduces the need for expensive infrastructure upgrades paid for by all ratepayers. In summer 2012, PJM, Maryland’s regional grid operator, cancelled several major transmission line projects once deemed critical to maintaining grid reliability in the state, saving almost $4 billion, according to the Federal Energy Regulatory Commission. Energy savings through EmPOWER Maryland also clear the air, reducing emissions of smog-forming nitrogen oxides by 1.5 million pounds per year—equivalent to the amount emitted by 75,000 of today’s passenger vehicles. While utility-run energy efficiency programs are delivering significant benefits, they are failing to achieve the energy savings target established in the EmPOWER Maryland Act. The PSC’s failure to set clear standards has hindered development of strong utility energy efficiency programs. The PSC has rejected many utility programs that do not meet its narrow, yet poorly defined, standard for cost-effectiveness, driving utilities to “play it safe” and propose only programs that deliver short-term energy savings at the lowest possible cost. 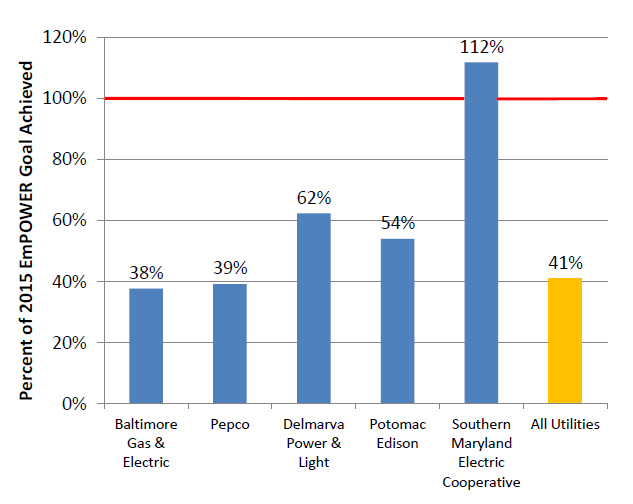 Utility programs are not designed to achieve EmPOWER Maryland goals. In part because of PSC restrictions on the type of energy efficiency programs utilities have been allowed to pursue, utilities have not proposed programs sufficient to reach EmPOWER Maryland energy savings targets. For example, utility programs currently approved for 2012-2014 could only reach 73 percent of the utilities’ 2015 energy savings goal, even if they successfully deliver all projected energy savings, according to Maryland Energy Administration. To get back on track, utilities will have to propose—and the PSC will have to approve—more programs that reach beyond the “low hanging fruit” of energy efficiency opportunities and provide deep, long-term energy savings. Utility programs are not delivering projected energy savings. Five years into the EmPOWER Maryland program, utilities have only achieved about 40 percent of the energy savings needed to achieve EmPOWER Maryland goals. (See Figure ES-1). Some of this shortfall is due to the shortage of innovative energy efficiency programs among EmPOWER Maryland utilities; however, existing programs have not attracted enough customer participation, nor delivered enough energy savings per customer. 1. Target whole buildings and systems for efficiency improvements—The nation’s best new construction and retrofit programs focus on improving the overall energy performance of a building, rather than replacing individual inefficient appliances or pieces of equipment. Some programs reward contractors with financial bonuses when installed measures achieve a certain level of energy savings. A Massachusetts program, for example, offers contractor incentives up to $1,300 for completing comprehensive energy efficiency measures certified by Energy Star. In many cases, this motivates contractors to actively market stronger efficiency measures to customers. 2. Embrace the next wave of energy-efficient technology—The best energy efficiency programs achieve deep energy savings by fostering widespread adoption of the next generation of super-efficient products, technologies, building materials and design. Some appliance programs offer larger rebates for appliances that achieve greater energy savings than the last generation of energy-efficient products. Other programs are using smart meters and smart grid technology that allow ratepayers to track and manage their energy use. Several EmPOWER Maryland utilities have recently launched smart metering programs. 3. Reach out to new markets and populations—Emerging programs are using new strategies to reach new customers. Energy efficiency programs are beginning to address multifamily housing developments for the first time. In multifamily housing, tenants pay for energy costs, but they do not have control over capital improvements to the building that may save energy—resulting in split incentives that can make program design difficult. New programs tackle this problem by either addressing the needs of tenant and building owners separately, or by bringing these groups together with housing authorities, utilities or non-profit organizations to leverage resources. 4. Enlist allies and trade partners to expand program reach—Making energy efficiency a visible and valued element in our economy requires support from manufacturers, distributors, contractors, retailers and consumers, and new programs supply these groups with tools and incentives to make them effective allies. Rather than attempt to develop their own marketing strategies, some utilities provide incentives for retailers who meet sales targets for more efficient appliances. Because of the personal contact that contractors have with customers, some programs offer specialized sales training and focus on improving contractors’ awareness of utility energy efficiency programs, so that they can help sell more comprehensive measures. Set clear standards for program approval—The PSC’s reluctance to establish and adhere to a clear standard for program approval has significantly slowed utility progress toward meeting EmPOWER Maryland energy savings goals. A clear standard would help utilities avoid wasting valuable time and resources on energy efficiency programs that the PSC will ultimately reject, and encourage utilities to pursue stronger programs. Establish energy savings goals beyond 2015—The state should establish an aggressive statutory goal for energy savings among utilities after the current cycle of EmPOWER Maryland programs ends in 2015. Hold utilities accountable for their performance—The state should work with the PSC to establish a structure of penalties and incentives to hold utilities accountable for failing to meet EmPOWER Maryland targets, and to drive them to do better. Approve more utility programs with longer payback periods—The PSC should approve utility programs that deliver cost-effective energy savings over several years—rather than approving only those that deliver savings in the short term at the lowest possible cost. Therefore, the PSC should define “cost effective” programs according to the anticipated payback period for each type of program, which can vary widely from sector to sector. All programs should not be required to become “cost-effective” over the same time period. Recognize all the benefits of energy efficiency – The PSC should follow the lead of states with successful energy efficiency programs and adopt a broader cost-effectiveness test for approving programs that captures other benefits of energy efficiency, such as avoided costs of building transmission lines and power plants, as well as public health benefits of using less energy, such as avoided air pollution. Create a financing program for energy efficiency improvements—The state should set up a loan program or other financing mechanism to help eliminate financial barriers for homeowners and business owners who want to make energy efficiency improvements. One-time incentives and rebates are very effective at reducing the up-front costs of these improvements, but a loan to cover the remainder of these costs would both increase participation in energy efficiency programs and encourage customers to install more comprehensive measures. Loan programs can be particularly useful because they can increase the impact of limited government funds, allowing them to be recycled as they are repaid. Restore funding to energy efficiency programs—While utility-run EmPOWER Maryland programs are funded through a surcharge on ratepayers’ utility bills, non-utility energy efficiency programs have been supported with revenues from the sale of carbon allowances in a regional cap-and-trade agreement designed to limit global warming pollution. Forty-six percent of this funding was originally allocated for energy efficiency programs, but since 2009 more than half of it has been diverted to direct bill-pay assistance. Bill-paying assistance provides a lifeline for consumers during difficult economic times, but diverting money from energy efficiency programs eliminates another important set of benefits for consumers while ensuring higher electricity consumption and more pollution in years to come. The state should restore all diverted energy efficiency funding.